I post weekly on Wednesdays at the Stampin Sisterhood blog. I used Rubbernecker's Side Butterfly image (see first photo below) and a sentiment from the Butterflies Are Free set (second photo) for my design today. 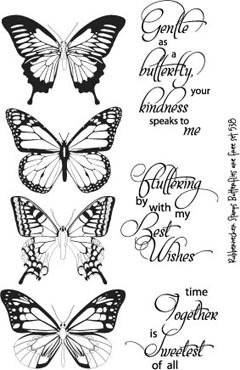 If you'd like to see what I created with these images, please swing by the Stampin' Sisterhood blog and let me know what you think! Thanks, and have a great day!